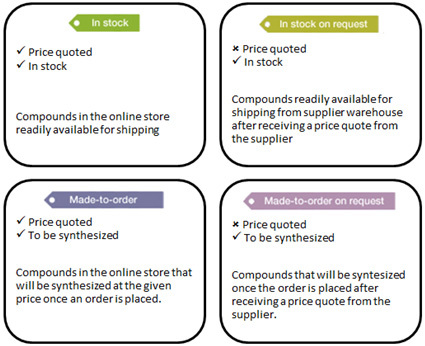 I recently wrote that all compounds can be grouped into four groups depending on whether they are (A) stock or (B) made-to-order products and (1) easy order or (2) quoted items. I wanted to hear your opinion how better to name each of these groups. Thank you for your thoughtful comments you emailed in privately or left on the blog. "If you look up the dictionary definition you will see it says something along the lines of "real, having a physical existence, discernible by touch", which is not true of virtual compounds. I think its use is just plain wrong in this context." But then in the next week I was reading a manuscript that is still in the press that divides all compound sources into purchasable and tangible (that is – virtual). So clearly definitions are not as clear and self explanatory as their inventors think. In stock items: at least one supplier lists the compound as an item they have in the warehouse. Made-to-order compounds still need to be synthesized. We added “on request” to the tags for items that can’t be ordered yet in our online store. Where are these tags displayed on our website, you ask? They aren’t yet. But you will see them soon!